The Rochester Police Department is now offering a location to properly dispose of worn and tattered American Flags. A red, white and blue flag collection box was built as a joint effort by the Old Colony Vocational Technical High School carpentry and graphic arts departments, which did the painting. The box is located in the lobby of the Rochester Police Station and is accessible 24 hours a day, 7 days a week to anyone wishing to have their American Flag disposed of correctly. 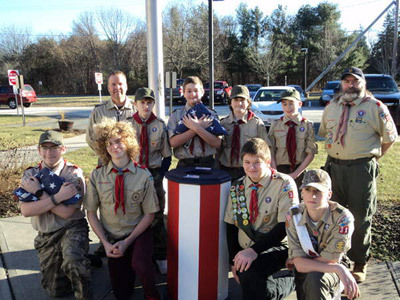 Rochester Boy Scout Troop 31 will oversee the correct disposal of the flags on an as needed basis. As a revered symbol of freedom and justice, the flag of the United States of America needs to be treated with the utmost respect. This respect extends to the flag's eventual retirement and destruction.